Star Trek and Dan Dare are two very similar franchises from different sides of the Atlantic. Both essentially revolve around the same basic premise of a future that is a perfect utopia where all races and minorities live together in peace and the both also explore many of the same themes too such as journeying into the unknown and making contact with hostile alien races. In this article I am going to run through all of the similarities between both franchises. In many ways Dan Dare really is the British Star Trek or since Dan Dare came first then Star Trek is the American Dan Dare. I am not saying that Star Trek was inspired by Dan Dare. Its possible but I would doubt it as Dan Dare to this day has never been popular in America, in fact I’m not sure its even been published in America and I don’t think Gene Roddenberry was an anglophile so I’d very much doubt that Dan Dare inspired Star Trek. I think both were really products of the era’s they came from. The first couple of decades after the war where an unsure, frightening time where no one was sure if we would even survive and not be plunged into an atomic third world war, yet at the same time there was also a sense of hopefulness that we would actually create a better world and there were many great achievements made during the first few decades after the war that would benefit future generations such as the establishment of the NHS in 1948, the civil rights movement in America in the 60’s, the legalisation of homosexuality in the UK in 1967, the second wave feminist movement which began in the early 60’s in America as well as huge advancements in technology such as the first man on the moon in 1968. Dan Dare and Star Trek simply reflected both the hopefulness and pervading sense of fear from that time with the perfect future of Dan and Kirk’s world’s being what we hoped we would create through our social justice movements and new advances in technology, yet at the same time humanities hostile interactions with races like the Treens and the Klingons which could have at any moment erupt into a full blown intergalactic war which would have wiped humanity off the face of the universe reflected the cold war paranoia of the times too. I have written about the similarities between Dan Dare and Star Trek briefly before but here I am going to go into a much greater detail as I think there a number of interesting parallels between the two great franchises. In some ways Dan and Kirk seem like polar opposites. Dan is very much the stiff upper lip, keeping his cool in a crisis type of hero whilst James T Kirk is often a very emotional, over the top, even at times downright hysterical hero. Also Dan is practically asexual whilst Kirk is famously a ladies man who teaches many an alien woman “how to love”. Still despite this there are some similarities between the two main characters. Kirk meanwhile was very much based on Horatio Hornblower as was his successor Captain Jean Luc Picard. Whilst Dan and Kirk were advertised as being the heroes of the future there were very much old fashioned types of heroes at their core with Kirk really being the classic swash buckling, dashing captain and Dan being a classic war hero. Both also were presented as being an odd combination of a being a very much by the book type of hero and a maverick who played by his own rules. Dan and Kirk are men who are devoted to Spacefleet and the Federation respectively, yet at the same time because they know the rules so well they can bend them and find little loop holes in them if they need to. They never just simply break the rules and ignore all the consequences. They are much smarter than that. Also as they are the people who are out in the deep recesses of space constantly finding and encountering new things then they are naturally more open minded and foolhardy than those in charge at the same time. Their methods were somewhat similar too in that both preferred to resolve their differences in peaceful ways and even showed mercy to their most vicious enemies. In one episode of the original series Captain Kirk forgives and provides aid to a hostile race of aliens from the Andromeda galaxy. These aliens had taken over Kirks ship and brutally killed members of his crew, yet at the end of the story he still offers them aid simply to help their species go on. Dan meanwhile memorably shows mercy to the Treens in Voyage to Venus when he and the earth men finally defeat them and they don’t even take the food supplies they need back to earth by force and simply ask the Treens for it. Despite this however if need be Dan and Kirk will use force, even lethal force if they have to and they are both very much action heroes at their core. Both Dan and Captain Kirk have been accused of being imperialistic heroes too despite the fact that both series were very progressive in some ways. Spacefleet in Dan Dare and the Federation in Star Trek though supposed to represent all of humanity (and other races) in the future both it has been argued simply represent Britain and America and Dan and Kirk who often travel the universe convincing other races to follow humanity’s way of life have been accused of simply being advocates of the British and American way of life being superior. They never force their way of life on others, but that is often the message at the end that the aliens they encounter should be more like them and thus some have seen both Dan Dare and Star Trek as being somewhat imperialistic works. Personally I don’t agree with this criticism myself. Remember that often the races that Kirk and Dare encounter are savage war like monsters who wish to destroy other races, planets, even whole galaxies. Yes its very much a good humans vs bad aliens, but then again so is a lot of sci fi. War of the Worlds, Mars Attacks, even Doctor Who though the Doctor is an alien most stories will still involve humanity having to defend itself from alien monsters such as the Cybermen and the Daleks. Its nice when we do get a bit of variety and see aliens who aren’t just the evil invaders but still I personally don’t think the makers were intending it to be a case of Britain and America are better than everywhere else. Very few of the aliens in Dan Dare and Star Trek are meant to represent actual other human cultures, most of them are just monsters. In fact in Dan Dare only the Treens are meant to represent another actual human culture, Nazi Germany and I definitely don’t see anything wrong with saying our culture is superior to theirs and I am sure nor would most people. Still it is true that Dan Dare and Star Trek despite their best intentions to present us with a vision of the future where everyone was treated equally did still present us with very British and American visions of the future, but again that can be seen as simply being a product of the times they came from. Dan and Captain Kirk are still very much almost stereotypes of the perfect British and perfect American heroes. Kirk and Dan are fairly similar characters as you can see with the real key differences between them being cultural and also the fact that both arguably reflect their creators personalities. Frank Hampson who created Dan Dare was a devout Christian with Dan having originally been conceived as a vicar. Thus there was never even the tiniest bit of romance between Dan and his female companion Professor Peabody. Gene Roddenberry meanwhile was a notorious womanizer. He was having an affair with both Nichelle Nichols who played Uhura and Majel Barret who played Nurse Chapel during the making of Star Trek. Thus its not surprising that Captain Kirk as a result was much more promiscuous. Still despite these differences both Kirk and Dare were similar types of heroes, a big square jawed, dashing, more old fashioned patriotic hero stuck straight in a futuristic environment. One of the key aspects of Dan Dare and Star Trek was that both presented us with future’s where things had worked out for us in every way. The technology to start with had obviously improved. In both visions of the future we now have big, gorgeous, brightly coloured spaceships that can take us from London to Venus in a matter of minutes, we have colonies on other planets and we have also managed to find a cure for many forms of disease too. Society overall had also improved greatly too. All countries live together in peace and harmony, racism, sexism and prejudice in general is gone and there are no wars. Added to that humanity has also made contact with highly advanced alien creatures and established a friendly relationship with them. Both series stood out as a result of this for many reasons but chief among them was fact that in most forms of science fiction the future was presented as extremely negative. Either we had been conquered by aliens, or eaten by mutants, or destroyed in a nuclear war or the machines had overthrown us, or we had become monsters ourselves, both figuratively and literally. Thomas More’s 1516 novel Utopia had presented us with a perfect society, but it was Dan Dare and Star Trek that really brought the idea into the modern day space age. Some reviewers have criticised both series for being too upbeat and lacking the cynicism of other sci fi series such as Blake’s 7. Still at the same time it cannot be denied that both Dan Dare and Star Trek have had arguably a bigger impact on society than many other sci fi franchises because of the positive version of the future they have presented. They both inspired astronauts, scientists and even architects to try and create the future that they showed us. Both Dan Dare and Star Trek became renowned for promoting diversity and equal rights. They regularly gave strong roles for non white characters in a time when such a thing was not common. In the first Dan Dare story Voyage to Venus a black man leads the final attack on the Mekon’s base. He is shown to be Dan’s superior and is depicted as a brave, charismatic, charming man who is liked and respected by all his men including Dan who he jokes around with. Remember in 1950 when this story was released racism was still prevalent in the United Kingdom and would be for the next 15 years. Towards the end of the 50’s there were the Nottingham race riots and posters that featured racist slogans. Thus Dan Dare that featured black men as captain, pilots and world leaders truly was decades at head of its time. One story called The Phantom Fleet was very much in favour of immigration. The story began its run in April 1958 just before the Nottingham race riots and ran right the way through them. It also came just 4 years before the Commonwealth Immigrants Act in 1962 which restricted the entry of black immigrants into the United Kingdom. The Phantom Fleet saw a group of aliens called the cosmobes flee to our planet out of fear from a race of hostile monsters. The creatures who are aquatic wish to live in the worlds oceans but there is a debate about whether we should let them in among the worlds leaders and in a further subtle nod towards the then current immigration crisis the leaders who are in favour of letting the aliens in are all dark skinned. Of course it turns out to be the right thing to let the Cosmobes in as they not only end up helping to save us from the monsters but end up benefiting our society and planet too. The plight of the Cosmobes was obviously a metaphor for the then current influx of immigrants into the United Kingdom from the Caribbean and the resultant tensions in our society. It obviously made the case for immigration by not only presenting it as the decent thing to do to help the Cosmobes in their time of need, but it also showed earth society improving as a result of allowing the Cosmobes in. The story also featured both white and black men among Dan’s team with Dan at one point describing them as the finest team he has ever assembled. Remember this story which had black and white men working together, saving each others lives, even just sitting and chatting and joking with each other and also revolved around our heroes letting outsiders in and being all the better for it, would be being released in shops right in the middle of massive riots in the middle of the streets over racial tensions. Thus it was fairly bold to say the least. Dan’s crew was made up of people from different ethnic backgrounds. Among his team included Lex O’Mailey who was Irish. At that point there was also plenty of anti Irish sentiment in the UK too with there being plenty of signs saying No Irish, No Blacks across the United Kingdom. Once again Dan Dare which featured its main character working with black and Irish men would have helped in some small way to curb these racist attitudes as Dan Dare was at the height of its success the most popular comic in Britain reaching sales of over 3 million. The first issue of Dan Dare also saw him working alongside both the Chinese and the Russians. Again during the 50’s its hard to imagine many works of fiction portray these two communist nations as anything other than non sympathetic. Just take a look at the Ian Flemying Bond Novels from the 50’s. Star Trek meanwhile which came 16 years later (Star Trek ironically started one year before Dan Dare finished) would similarly give stronger roles for racial minorities. 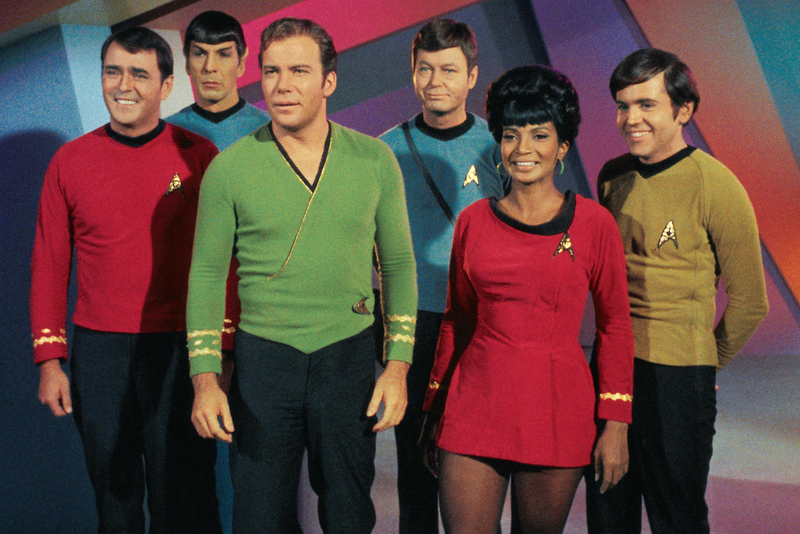 Among the crew of the USS Enterprise included Checkov a Russian, Hikaru Sulu a Japanese man and Uhura a black woman as well as Montgomery Scott a Scotsman. The show marked one of the first times there was a black woman on television who wasn’t simply a servant. As the communications officer she played a vital role in the show. Nichelle Nichols apparently wanted to leave the show after its first season, but she was talked out of it by Martin Luther King who told her that her role in the show was very important! Uhura would later have the first interracial kiss in an American scripted television series. Though its true that Dan Dare and Star Trek were still of their times in some ways, ultimately they broke down barriers for roles for minorities in their respective mediums. Dan Dare and Star Trek also had strong feminist themes too. Ultimately the two main characters were still very much big macho, man’s man’s heroes, and there are examples of vintage 50’s and 60’s sexism in them, but still both series did try and give stronger roles for women. Dan Dare had Professor Peabody who was a genius scientist. Peabody more often than not played a key role in the stories she was in. Dan had nothing but the utmost respect for her, in fact often he and the others were completely dependent on her advice and her inventions. Frank Hampson said that he felt he struck a blow for women’s lib with the inclusion of Peabody in the cast. Star Trek the Original Series on the other hand I always felt had weaker female characters. Even Uhura didn’t really have that much of a character, Janice Rand vanished after just a few episodes and Nurse Chapel was a complete wet fish. Still whilst these characters may not have been as strong as Peabody, they did all still represent stronger roles for women as they were all women in positions of power, and all still shown to be strong, intelligent and resourceful characters at the end of the day. Also in all fairness to Star Trek originally Gene Roddenberry had intended for a female character named Number 1 to be the second in command of the ship. Number 1 was a cold, logical and highly intelligent character exactly like Mr Spock who was still in the pilot but was a very different emotional character. Ultimately the character of Number 1 was jettisoned because test audiences didn’t warm to her so her cold and logical personality was transplanted to Spock for the series. Obviously that was the right decision as Spock was a much stronger character, but still it does go to show that Gene Roddenberry did try to create a different type of role for women on television as a a cold logical scientist. Number One would have been like Peabody the brains of the operation, but ultimately it was not to be. 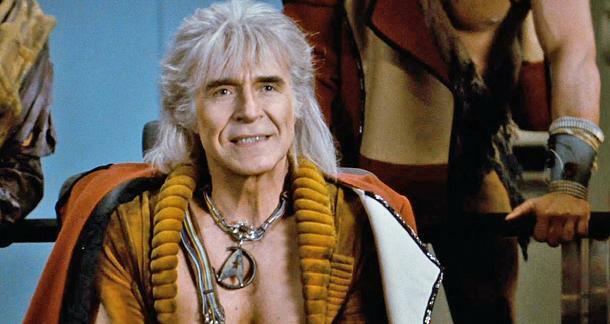 Though Khan has only appeared in 3 stories, one episode of the television series and two films Star Trek 2 Wrath of Khan and Star Trek Into Darkness. He is still regarded as Captain Kirk’s archenemy. 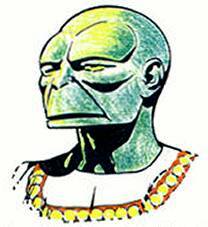 The Mekon meanwhile was the most famous of Dan Dare’s enemies having appeared time and time again throughout all iterations of Dan Dare over the decades. Khan and the Mekon are actually fairly similar villains. At a first glance they couldn’t seem more different. Khan is the augmented superman who has 5 times an ordinary humans strength whilst the Mekon is a frail weak creature that can barely move without its flying chair. Still they both are the same basic idea. They are both creatures that have been genetically engineered to be superior to other members of their kind so that they can lead them. In the Mekons case his intelligence was greatly enhanced hence his enlarged cranium whilst in Khan’s both his physical strength and intelligence were increased. Both were not the only one of these genetically engineered tyrants but they both became the most notorious. They were both also ruthless tyrants who were served by other genetically engineered so called supermen who believed that they are superior to all other life forms in the universe. Khan and the Mekon were the perfect enemies for Kirk, Dan and indeed the whole of the Federation and Spacefleet as they were the darker side of scientific achievement. The Federation and Spacefleet represented our desire to get into space and see what was out there. The Mekon and Khan meanwhile represented Eugenics, not only because they themselves had been experimented on and altered to fit a warped idea of perfection, but also because they despised others for supposedly being inferior. The horrors of the Nazi Eugenics were still fresh in people’s minds and so the Mekon and Khan reflected that. Spacefleet and the Federation where what we wanted in terms of all races living together and technology being used for things like building advanced spaceships, curing diseases whilst the Mekon and Khan were a terror from the past that abused science in an effort to create the perfect being and a philosophy that said that one race was superior to all the others. The signature aliens from both franchises were both meant to represent another nation. In the Treens case Nazi Germany, in the Klingons case Soviet Russia. The Treens consider all other life forms in the universe to be inferior to them, a belief which is obviously similar to the Nazi’s belief of racial superiority. The Mekon meanwhile is obviously a fuhrer figure to the Treens. In their first story the Mekon rules over half of Venus and the Treens are shown to rule over a race of humans called the Atlantines who are rounded up and kept in concentration camps around. The Mekon also performs horrific experiments on them and the captured members of Dan’s team such as Digby and at one point is shown to try and kill them using a gas chamber. All of this evokes the then recent horrors of the Second World War. At the end of Voyage to Venus the Mekon is overthrown and he and his most loyal Treens go on the run for the rest of the series. The hunt for the Mekon and his most loyal Treens throughout the remainder of Dan Dare can be seen to mirror the hunt for Nazi war criminals such as Joseph Mengele after the Second World War. The Klingons meanwhile are obviously the USSR and several episodes of Star Trek play on the cold war paranoia with Kirk and the Klingon commanders despite their open hostilities to one another doing all they can to avoid a full scale intergalactic conflict which they believe would completely destroy both of their civilisations. The final film to feature the original Star Trek cast was described by Leonard Nimoy as “what if the wall came down in space” and had very strong references to the then current tensions between Russia and America with the Klingon leader who wants to establish peace between the Federation and humanity being based on Gorbachev. The Klingons and the Treens though larger than life aliens represented very real concerns for both the British and the United States in the 50’s and the 60’s. The fear of a war to truly end all wars and also the prospect of Nazi war criminals being free and roaming around Europe and it used them to give its villains a greater edge. In Britain we also hadn’t really gotten over World War 2 at that point either. Its memory still lingered in the minds of people and thus the Treens much like the later Daleks and Davros from Doctor Who who were the successors to the Treens and the Mekon in British popular culture really were the perfect monsters as to children they were just scary villains but to adults they were a grim reminder of the past. Sondar and Spock are quite comparable characters. Sondar was a member of the Treens who eventually after experiencing emotions realised how twisted their beliefs were and helped Dan defeat the Mekon, and eventually became a trusted member of Dan’s team. Spock meanwhile was a half Vulcan/ half human and the science officer of the Enterprise and the best friend of James T Kirk. Both characters helped to highlight how not only were all the people’s of the earth living together but we had now reached a stage where we were living with other species too. It was a multi cultural and multi species version of the future. Sondar and Spock’s alien nature’s and inability to understand human culture and customs are often used for some moments of comic effect in both series too. Both Sondar and Spock whilst cold and logical aliens also did have more human qualities with Sondar being the only Treen who experienced emotions and Spock similarly due to his human heritage was one of the few Vulcans who ever expressed human emotions too. There have been many sequels and spin offs of the original Dan Dare and Star Trek. Ironically Star Trek has had greater success than Dan Dare, though both have been revived including the Star Trek film series 5 times each. The original Dan Dare was a massive success that ran for 17 years 1950-1967 whilst Star Trek the original series was a flop that lasted only 3 years. Still the sequels to Star Trek have definitely been more successful not just commercially but in terms of remaining true to the spirit of the original. The first sequel to both came about in the late 70’s. 2000AD revived Dan Dare in 1977 and Star Trek the Motion Picture arrived in 1979. Star Trek the Motion Picture featured the original cast and though it wasn’t the strongest of the Star Trek films it did its job in bringing a much wider audience to the series and paved the way for the much, much better sequel Star Trek 2 Wrath of Khan which is in my opinion one of the greatest films ever made. So much of what we think of as Star Trek comes from the films whether that’s William Shatner’s classic KHAAAAAAAAAANNNNNNNNNNNNNNNN!!!!!!!!!! or Spock’s moving death scene, or Kirk kicking the evil General Kruge into a huge pit of Lava declaring “I HAVE HAD ENOUGH OF YOU!” the films added a huge amount to Star Trek’s legacy. The second Dan Dare series meanwhile was very different to the original. Its premise saw Dan be disfigured in an accident whilst stopping the Mekon after which he was placed in suspended animation until medical science could reach a point where it could help him. 200 years on he is revived and given reconstructive surgery which makes him look completely different. By this point space fleet has become the Federation and it is a much more corrupt organisation. The Mekon meanwhile is still alive and having been banished from our solar system many years ago is a much more desperate and crazed villain than before. The series was blasted by fans of the original Dan Dare as it really was Dan Dare in name only. Other than the Mekon none of the original cast returned and the series was much more violent and considerably darker than its predecessor with Dan himself being reimagined more as an anti hero than the stiff upper lip decent chap he was in the original series. Despite the grilling it got from old school Dan Dare fans the series was still successful and ran for a few years. In the 80’s Dan Dare and Star Trek would receive two more revivals. The Eagle, the comic that had ran the original Dan Dare strips was relaunched and it once again featured Dan as its flagship character. This version of Dan was said to be the grandson of the original who once again battled the Mekon who returned after a long absence to try an conquer humanity. This version lasted for over 10 years almost as long as the original and was very successful throughout most of its run, but by the early 90’s its sales had declined and it was eventually cancelled. Star Trek meanwhile returned to television in 1987 with Star Trek the Next Generation. Much like the second Dan Dare this was set many years after the original, 77 to be precise and it featured a totally new cast of characters. Whilst it got off to a slow start it eventually became a massive success and ran for over twice as long as the original. In the 90’s Star Trek would flourish with two more series Star Trek Deep Space Nine and Star Trek Voyager both of which ran for 7 years each, whilst Dan Dare after the revamped eagle finished was revived for a brief miniseries by Grant Morrison simply called Dare. In the 21st Century both’s popularity began to die down. There was another Star Trek series titled Enterprise that came to an end in 2005, and the beginning of a new film trilogy in 2009. Dan Dare meanwhile was revived first in a short lived animated series at the start of the 21st century and then in a miniseries in 2007 and 08 which marked the last mainstream Dan Dare series to date. There has been a comic called Spaceship Away which though only having a small circulation has been ongoing since 2003. There are plans for 2 new revivals of Dan Dare and Star Trek in the near future. Not only will there be another Star Trek film released this year in time for its 50th anniversary but there are also plans for a new Star Trek television series for the first time in over 10 years. Dan Dare meanwhile will be revived this year in a new audio series which will feature adaptations of the old 50’s stories. As you can see Star Trek has had the greater success in revivals in terms of not only commercial success but also in terms of what they have brought to the Trek mythology. There are so many iconic moments, characters like Jean Luc Picard, monsters and aliens like the Borg and the Cardassians that came about in the later series. The sequels to Dan Dare though I loved all of them (except for Grant Morrisons version that was absolutely dreadful) never really entered into popular culture the same way as the original. Whilst a lot of what we think of as Star Trek comes from the films and television series as well as the original classic series, virtually all of what Dan Dare is remembered for in British popular culture is from the original Frank Hampson, 50’s and 60’s series. I think the reason the revivals of Star Trek have been more successful is because they remained true to the message of the original of things getting better in the future. Whilst the Federation went through its fair share of troubles in the sequel series it was still the same benevolent force that it was in the 60’s series, the Enterprise is still piloted by an interracial and multicultural crew. If anything the future in the sequel series is even better than the one in TOS. The Klingons and humanity are now allies and in the sequel series women are shown to be able to be the captains of star ships. Sadly in the last ever episode of TOS (which I also consider to be one of the weakest episodes) it was revealed that women weren’t allowed to pilot starships which kind of ruined the whole idea of this being a perfect utopia. Fortunately Star Trek Voyager which featured a female lead, Captain Janeaway rectified this. The sequels to Dan Dare meanwhile always tried to make Dan Dare darker and edgier and would often try and show the world Dan came from as being corrupt under the surface which I think was all wrong. The whole point of Dan Dare much like Star Trek was that it did present us with a positive version of the future. Ironically that’s why it was so no pun intended daring, because it did to things like have Dan take orders from a black man in what was a thoroughly racist time in the UK. Little kids would see signs that forbade black men from entering the premises, posters about not wanting a niger for a neighbour and then read comic books where Dan Dare their hero and role model was taking orders from a black man and joking around with him and looking up to him. Sadly however I think a lot of the writers of the revivals simply didn’t get Dan Dare and if anything looked on the original as a dated piece of British imperialistic propaganda. Thus they tried to eliminate the optimism of it. Grant Morrison said that he felt the original series only worked if it was taken ironically and that he hated 50’s optimism and and ideals that Britain was better than the rest of the world. He even joked that Dan Dare was a fascist. Thus his version had all of Dan and his main characters either be portrayed as unsympathetically as possible or suffer horrible fates with Peabody hanging herself and Dare himself getting raped! The next Dan Dare revival needs to embrace the optimism of the original rather than reject it. 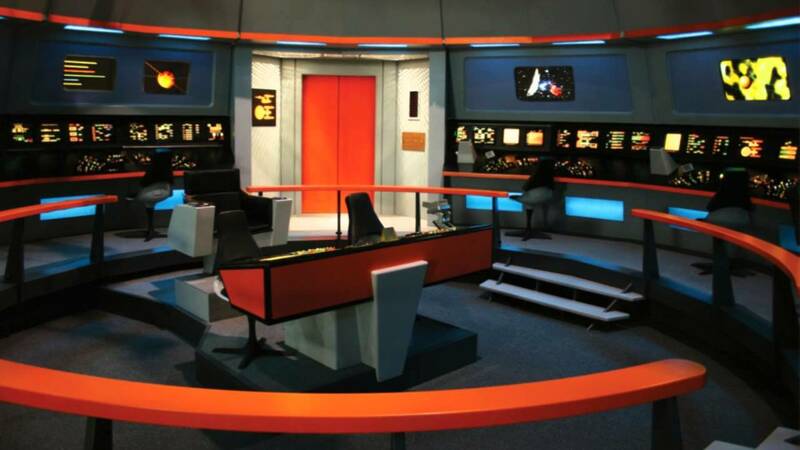 It needs to much like the later Star Treks if anything improve on the originals optimistic vision of the future. Have LGBT people be among Dan’s crew, which obviously they couldn’t do in the 50’s, really show us a world where everyone is an equal. I think particularly in the current climate such a comic book, tv series or even audio series would appeal to people more than just another dark space opera. Both Dan Dare and Star Trek have left a huge impact on popular culture. They have influenced many other forms of fiction and real life scientists and astronauts. Stephen Hawking has said that Dan Dare was what got him interested in cosmology in the first place and that he would not have become a scientist had it not been for its influence. Many astronauts meanwhile have been inspired by Star Trek. Doctor Mae Jemison the first black woman to fly aboard the space shuttle cited the character of Uhura as her main inspiration. Neil Armstrong himself also cited Star Trek as an inspiration and was a devoted fan of the series. 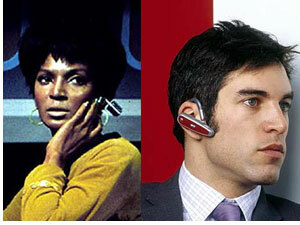 Many pieces of technology have even been inspired by Star Trek too. Dan Dare has also been referenced in various pieces of music too by artists such as David Bowie, Pink Floyd and Elton John. Both David Bowie and Elton John cited Dan Dare as their favourite childhood hero. Dan Dare also had a massive influence on science fiction on British television. Doctor Who was very heavily inspired by Dan Dare. Most famously the Mekon was an inspiration in terms of character and design on Davros the mad creator of the Daleks whilst the Treens were also an inspiration on the Daleks, the Cybermen and the Sontarans the three main monster races in Doctor Who. It also inspired Thunderbirds and many of the late Gerry Andersons series. Star Trek meanwhile has influenced almost every single space opera in some way or another with the likes of Babylon 5 and Blake’s 7 in particular both owing a huge debt to the original Star Trek series. Star Trek and Dan Dare as you can see were both somewhat similar franchises. Both presented us with a positive vision of the future, both took old or modern day fears such as the Nazi’s and the Cold War and placed them in the future, both also featured somewhat more old fashioned leading heroes and both struck a blow for civil rights and feminism in many ways too though their positive versions of the future. The similarities between them are ultimately however purely coincidental due to Dan Dare’s limited life outside of the United Kingdom. Though one small funny connection between them exists in William Shatners version of Rocket Man. 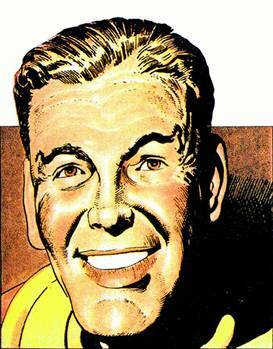 Rocket Man by Elton John was partly inspired by Dan Dare. Elton John wrote another song about Dan Dare simply called Dan Dare Pilot of the Future, but Rocket Man was also partly inspired by him too.